Cambridge, MA - Addgene, a nonprofit plasmid repository dedicated to sharing plasmids and accelerating research, announced today that plasmid map and sequence displays on their website will be powered by GSL Biotech’s SnapGene Server software. 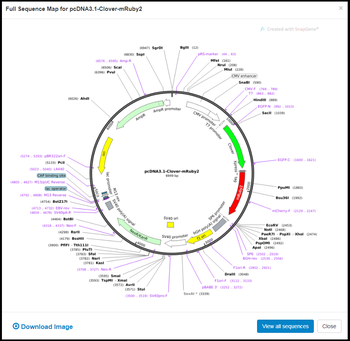 These updates allow Addgene users to quickly analyze plasmid features through easy-to-read interfaces. The new maps will annotate common plasmid features, such as resistance genes, tags, and Cas9, based on SnapGene’s extensive feature library. Additionally, the software gives users the ability to download sequence files in GenBank format and also in SnapGene’s .dna format, which can be read by the free SnapGene Viewer program. Addgene is a 501(c)3 nonprofit biorepository dedicated to facilitating scientific discoveries by operating a plasmid library for researchers. The repository contains over 53,000 plasmids contributed by 3,300 research labs around the world. Over a half million plasmids have been distributed to more than 90 countries by Addgene - with 11,000 plasmids currently shipping each month. Addgene also provides ready-to-use AAV and lentivirus preparations of commonly requested plasmids as a service to scientists - saving them time and providing thorough quality control. By authenticating, storing, archiving, and distributing plasmids, virus, and their associated data, Addgene is creating a lasting resource for research and discovery scientists around the world. For more information, please visit http://www.snapgene.com/.